MANY holy persons have had a special devotion to the mystery of the Annunciation, and one religious congregation has taken it as the badge of its distinction, and the type of its inward and spiritual life. They have fed their souls upon the thought of its profound secrecy and hiddenness, and its other unearthly characteristics, Mary's midnight prayer, the visit, the obeisance and salutation of the Angel, and the like. Others have brooded over the various perfections disclosed by our Blessed Lady at the time, and above all the magnificence of her tranquility. They have thought how intense must have been her humility not to have been shaken and ruffled then, and how firm her conformity to God's will that she should have been quiet at such a time and under the shadow of so unutterable a mystery. Others have regarded it as the fountain of the Rosary and dwelt rather upon the stupendous mystery of the Incarnation itself. One moment, and the Virgin blood of Mary was all her own. The immaculate maiden had not been clothed with the solitary prerogative of virgin Maternity. Another moment, and the Sacred Body had been instantaneously fashioned from her purest blood by the Holy Ghost Himself, perfect in every limb, symmetrical in every proportion, exquisitely formed for the keenest and most overwhelming suffering, and in all respects beautiful exceedingly. One moment, and the great empire of nothingness lay before the silent power of God, and no word was spoken over its dim and vast abysses. Far and wide lay the dark illimitable regions of possible creatures, but there was no stir in their stagnant and obscure depths. Another moment, and more resplendent than the light of heaven, more beautiful than all the spiritual and intellectual beauty of the countless Angels, more majestic than the manifold mysterious pomps of all creation beside, sprang forth from nothing the Human Soul of Jesus. One moment, and the Eternal Word was being eternally begotten of the Father, and from Him and from the Father the Holy Spirit was eternally and ineffably proceeding. All created natures were utterly separate and distinct from Him, neither had He assumed any of them Himself, nor descended to be, so to speak, a part of His own creation. But in one and the same moment, so instantaneously that except in mere imagination no atom of time came between, no swiftest, divinest and most lightning-like succession, but in one and the same identical moment the Holy Ghost had fashioned that Body from Mary's blood, and the Soul of Jesus had sprung from nothing and had animated and informed that wonderful Body, and the Body and the Soul found no need of human subsistence, for in that one same identical moment the Person of the Eternal Word had assumed them to Himself, and He was one Person with two natures, and the blissful Virgin was more incomparably virgin than before, and was a Mother too, the Mother of the Eternal God; and the tingling silentness of the quiet midnight filled the little room at Nazareth that night in March, and the unconscious stars drifted across the sky, and the lily was closed and sleeping in its vase, and the watch-dogs of the herdsmen of Nazareth broke ever and anon the stillness of the night, while the awful mystery was being accomplished. Morning rose on the earth, cold, clear, vernal; and the long-expected Redeemer of mankind had come, and no one but the Mother knew. Change the scene for a moment to a Catholic altar. It is the mid silence of the great function. One moment, and there is bread in the priest's hands, and wine, the fruit of the grape, in the chalice on the corporal. One moment, and there is the substance of bread, with its accidents inherent in it, and it would be the grossest of idolatries to offer any manner of worship to that senseless substance. One moment, and the Body of our Lord is at the Right Hand of the Father, receiving in the splendour of its ravishing magnificence the worship of the prostrate hierarchies of Heaven. Another moment, and what was bread is God. A word was whispered by a creature, and lo! he has fallen down to worship, for in his hands is his Creator, produced there by his own whispered word. One moment, and at the bidding of a trembling, frightened man, Omnipotence has run through a course of resplendent miracles, each more marvellous than a world's creation out of nothing, not as swiftly as a well-skilled finger sweeps down the keys of an instrument, but unspeakably more swiftly; for here there has been no succession: in one and the same identical moment the whole range of these miracles was traversed and fulfilled. There is the selfsame Body which the Holy Ghost fashioned out of Mary's blood. There is the self-same Soul that sprung in the fullness of its beauty from the sea of nothingness. There is the selfsame Person of the Eternal Word who in Mary's womb assumed that Body and that Soul to Himself. Only in this is the altar more wonderful than the room at Nazareth, that here many times a day, and on tens of thousands of other altars, from the northern fringes of everlasting snow to where the exuberant foliage of the tropics droops into the warm seas, and simultaneously on thousands of altars at once, this stupendous mystery is accomplished; and through the instrumentality, not of a sinless mother, but of unworthy, faulty priests. Moreover a new code of existence, without local extension, is conferred upon the Body of Christ, in addition to the mode which it already possessed in Heaven. And the sun shines in at the Church windows, and the tapers burn unconsciously on the altar, and the flowers shed their fragrance from the vases, while the great mystery is being enacted. But though inanimate nature has not wherewith to suspect it, and though the senses are deceived and penetrate not beyond the sacramental veils, the very miracle of whose continued unsupported existence they are unable to report, the mystery is no secret; the bended knee, the bowed head, the beaten breast, the shrouded face, the instantaneous hush, has revealed that there is not a Catholic child in the Church who does not know, and love, and fear, and worship with his heart's heart the transcending mystery of love. The marvel of consecration contains within itself the precious wonder of the Annunciation, and more besides. Who can tell the depths of sweetness which lie hid in the mystery of the Visitation? The Vicar of Christ and the successor of St. Peter has but just raised the dignity of the Feast. St. Francis of Sales founded his order of nuns to perform exterior works of spiritual and corporal mercy, and because they were to be uncloistered and to seek their work, he named them daughters of the Visitation. It pleased Providence that the Saint's will should not altogether be accomplished. They became cloistered and contemplative. Yet there was no need to change their name. There was more than enough of mystical sweetness and significance in that mystery to represent the fresh life of interior religion which they were now to lead. It were long to tell how many and how attractive were the virtues which the new Mother exercised in this mystery. How spiritual joy lent wings to her feet, and how she overcame her love of seclusion and flew from her nest over the hill-country of judea, full of charity, to communicate to St. Elizabeth, not the secret, for she knew the Holy Ghost Himself would communicate that to her cousin, but the joy of Messiah's coming; how Elizabeth hailed her as the true Mother of God, and how Mary's immaculate heart overflowed in glorious and prophetic song; and how the angels went with her on her way, attending the living Ark of the Covenant, and worshipping the world's Ruler who was hidden in the sanctuary of His chosen temple,-----all these it is not the season to expound. What we have particularly to do with, are the dispositions of Jesus Himself, and the wonders which He wrought. Truly He is in haste to be about His Father's business. Truly He is an impatient conqueror, to be thus early beginning His conquests, and laying the foundations of His world-wide empire. He cannot bear to be in the world for even so short a while, but sin shall feel the weight of His unborn arm. There was none to cast out of Mary. He had seen to that Himself long before. There was not even so much as the shadow of a sin which He could drown in the effulgence of His light. 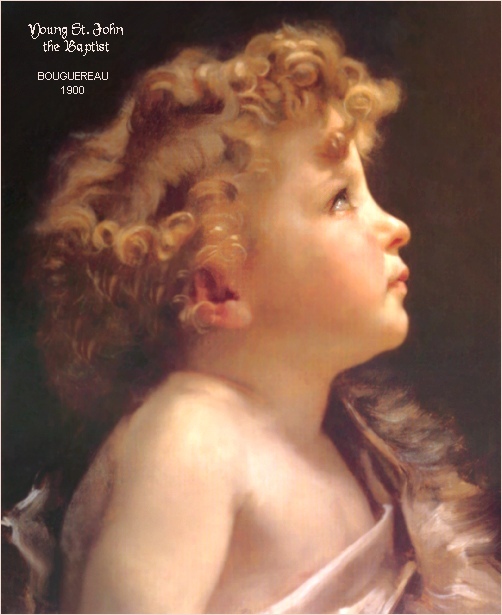 His first mission and ministry was in the womb, and the babe unborn the first conquest of His Divine apostolate. By and by we shall see Him pale and bleeding beneath the moonlit olives on the hill, whose umbrage shrouded the Creator in His astonishing mortal agony, and we shall know with what unutterable intensity He hated sin. Yet the modest picturesque mystery of the Visitation hides a hatred of sin no less intense, and which almost seems to be more powerful and more Divine. The Baptist in His mother's womb has been conceived in guilt, like the rest of Adam's children, Mary alone excepted. He is bound with the thraldom of the fall, with the chains of Original Sin. But the living Ark of the Covenant, the tower of David, the ivory tower, the seat of wisdom, and the marvellous vessel of devotion, brings her heavenly burden nigh to where he is; and the unborn Child destroys the sin and abolishes the curse of the unborn child. The Baptist leaps with exultation in his mother's womb, and worships, with the abounding gladness of his sinless soul, his Redeemer and His God hidden in the Virgin-Mother; for the full use of reason is conferred upon him, and the gifts of original justice are restored to him; and he is so hung over with the ornaments of grace that he shines and burns with a more than human light, and so to overflowing is he filled with heroic sanctity that of all yet born of women none is so great a Saint as that unborn John, the Precursor of our Lord: and Elizabeth wonders at the marvel that has been wrought within her while the Mother, whom generations bless, is singing the sweet thanksgiving of her humility, which Jesus is making in her heart and she is uttering with her tongue. And what is all sweetness in Communion, all joy in Benediction, all inward fluttering of the ravished heart before the tabernacle, but the antitype of this delightful mystery of the Visitation? And has it not always been Mary that brought Him to us? Look at our past lives. When did we come to love Jesus so burningly, so enthusiastically, as we do now? when was it and where, and how, and what reminiscences are mingled with il all? O my Mother! my Mother! I see as it were threads of gold running ever through the web of my past life. They are here and there, no part is without them, no fold but they are shining there. In places the Divine pattern is defaced, in others it is obscured, and the golden streaks themselves are tarnished; but still they are there, connecting one part with another, and giving unity to the whole. And when I hold the web up to the light of Heaven-----perhaps I do not see plainly, for I have had to weep so bitterly over that miserable past-----but it seems as if in that light, from the cradle, heresy-darkened, even to the maturity of man's years, the golden threads are always forming themselves into the dear Name of Jesus, and whichever way I look, if I read forward or backward, up or down, and on whichever side I turn the web, still I read Jesus, Jesus, always Jesus, nothing but Jesus. I never have a Communion but to thee I owe it. The tabernacle, the pyx, the monstrance-----the very beauty of the mystery is that it is thy Jesus, and not another; the Body that was formed from thee, and not a new one, which consecration brings. And when I come to thee on thy feasts, to look at thyself, to admire thy beauty, to praise thy grace, to glorify God for all thy gifts, to kneel before thee and tell thee all my heart in prayer, for thou art omnipotent in thine intercession, thou hast Jesus with thee and makest me feel Him even when haply I was not thinking of Him in my mind, though surely I am always loving Him in my heart. All our best life, all our spiritual life, is nothing but a succession of Visitations, Visitations from Mary bringing Jesus with her. But nowhere is the similitude so faithful as it is in the Blessed Sacrament. How often when we come near to the tabernacle, a secret fire comes forth, and our hearts burn within us without apparent cause. Cares fall off, tears are dried, doubts melt away, temptations are paralyzed, anxieties are allayed, our soul is bathed in quiet sudden jubilee. Joy, exultation, praise, delight, and the sense of forgiveness, the spirit of worship, these are exactly the fruits produced within us, as they were produced in the Baptist's soul. There is no one to whom the mere vicinity of the Blessed Sacrament has not been the cause of unnumbered blessings, even if he knew them not. But there are few who have not felt them, touched, handled, caressed them almost as if they were sensible things, so vivid and so solid have been the realities of grace. Our hands have handled the Word of life, says St. John. So it is with us. When love has made u! acquainted with the Blessed Sacrament, it seems as if His invisible presence upon earth could hardly have been so real, so plain, so cognizable, so undeniably evident, as His sacramental presence, It becomes hard to believe; not because the mystery is so appalling, its miracles so singular and so multitudinous, its difficulties sc obscure and so impenetrable. Oh no! but because, Our Lord's faith is of things unseen, and we seem to have seen Thee so clearly that we should know Thee and discern Thee now for ever more; and because faith is of things hoped for, and we have had Thee and handled Thee and tasted Thee and possessed Thee; and what is there left whereby to exercise our faith? Behold our hearts and our souls leaped within us for joy, and what were we that the Mother of our Lord should come to visit us, and bring her Burden nigh unto us, and that He, the cause and the charity and the speed of her coming, should work these secret miracles upon our hearts that would be almost innocent if they were unconscious that it was He, but alas! knowing Him, have been cold and wayward, peevish and estranged? 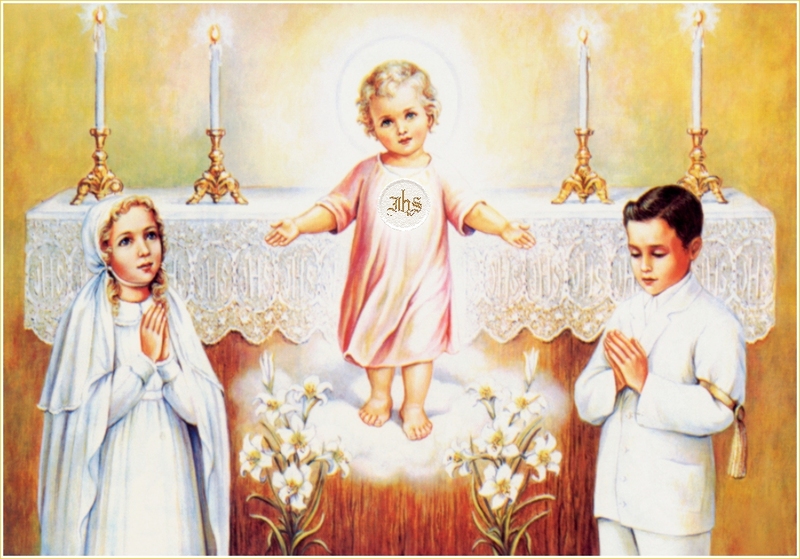 The mysteries of the Sacred Infancy as they gradually unfold themselves, now bring us in sight of a very tender and deep devotion which has long been dear to interior souls, and has often brought forth wonderful fruits in the spiritual life, devotion to the life of Jesus in His Mother's Womb. The whole mystery necessarily draws our thoughts to the life of the Eternal Word in the Bosom of the Father, of which adorable mystery His dwelling in the Womb of Mary is the copy and the manifestation; and we must have some understanding of the one in order to comprehend the other. Theology leads us to contemplate the Eternal Word in His everlasting and perpetual Generation from the Father, a Generation infinitely noble, infinitely pure, unbeginning, unspeakable and incomprehensible. The Bosom of the Father is the mystical name which we give to His Divine repose. It gives us, in imperfect words, the idea of a home, and thus enables us the better to figure to ourselves the Son going forth from that Bosom, though in truth He never left it, and His sojourn among men; for none hath come down from heaven but the Son of Man who is in heaven. We behold Him there in the plenitude of His Divinity, one with the Father by an unutterable union, co-equal, co-eternal, consubstantial with Him, and yet although His Son, in no way and in no sense subordinate, but independent. In that dwelling in the Bosom of the Father, we behold and adore the mutual love of the Father and the Son, and their ineffable conversation, and we worship as also true, co-equal, co-eternal God, that Love who is the Person of the Holy Ghost, eternally proceeding from the Two as from a single fountain. We see there the eternal plan of the Incarnation, and the series, as our ignorance forces us to call it, of those resplendent and dazzling decrees which concern Jesus, Mary, and the destinies of creation. The fall of the angels is foreseen after the predestination of Jesus and His Mother, and they are excluded from the remedial benefits of the Incarnation, which were decreed as if by superaddition when the fall was foreknown. We behold also the various choices of the Eternal Word in His Father's Bosom, His indescribable choice of His Sacred Humanity, His eternal choice of sufferings, of the sufferings of His whole life, of His death, and of the Cross in particular, and above all, that choice in which He manifests so incomparably His Divine perfections, His choice of His Mother, which choice was at once the single yet threefold fountain of her grandeurs, her graces, and her sorrows. But it is one thing to write all this in dry, harsh, technical words, and another thing to brood over it and foster it in the heat of prayer, when our spirits delight to prostrate themselves before the mysteries of the Most Holy Trinity, and in proportion to the depth of our abasement is the clearness of the lights which God mercifully causes to shine upon our souls. Then all these things become touching as a tale of love or grief among men, full of a thousand meanings, and each meaning full of tenderness and tears. If I have said it before, 10 bear with my repeating it again, our devotion to the Eternal Word is the measure of our devotion to Jesus, God and Man; and if the mysteries of the Thirty-Three Years and the Blessed Sacrament seem to yield but little light, heat and unction to our meditations, it is often for want of an intelligent and thoughtful and studious adoration of the divine mysteries of the Eternal Word. Now this life in the Bosom of the Father seems to devout souls made visible, intelligible, and familiar to them by our Lord's life in His Mother's Womb, and is the chief reason of that most interior devotion. Let us venture to describe it, as it has seemed to holy men. The Eternal Word, who has dwelt in the Bosom of the Father in incommunicable glory from all eternity, seems to begin a new life in the Womb of Mary. A change seems, of course only seems, to come over the Unchangeable; yet even the appearance of a change is a deep and blissful mystery. This new life of His is infinitely precious, infinitely pure, and all for us and at our disposal. From the first moment of His Conception the beatitude of His human Soul was perfect, and of all the blessed Souls He was the first, in the actual enjoyment of the Beatific Vision, as well as by predestination; and there is no other soul that ever has or ever will enjoy that Vision, whose beatitude is not obtained by Him, and without Him would not be: or even then whose beatitude is at all comparable to His. From that mysterious and inconceivably joyous first moment He had, as Man, a clear view of God. His was the first human soul that ever enjoyed it at all, and the only human soul that ever enjoyed it in this life; and His sight of God, at that first moment, as now, far exceeded in clearness the vision of all men and all Angels. His first act of love was the most perfect act which ever has been or ever will be; and it was the most comprehensive, for it extended to all the works of God, and most specially and ardently to all men. His joy in that first moment was ineffable. His Soul rejoiced in His Divinity to which it was united; it rejoiced in infusing graces into His Blessed Mother, and in destining, with clearest and minutest foresight, graces for each one of us in particular. His life was a life of incomparable adoration of His Father, of humble submission to Him as the Creator of His Sacred Humanity, of profound reverence, from His perfect view of the perfections of the Father, and of true worship, from a sense of the nothingness of His Human Soul. The same life of adoration may be considered in relation to the Holy Spirit, and in a most mysterious and unimaginable manner, to the contemplation of the Person of the Word by His Own Soul, to which it was instead of a human personality. The praise which He gave to the Most Holy Trinity in this secret life infinitely transcends all that the worship of all possible worlds could give. Every affection of His Sacred Heart was of infinite worth; and as they were countless, we may say that it worshipped God with momentary infinities of glory. Every affection too was an act, a real act, of most substantial worship; and yet not contented with all this magnificent homage of His Sacred Heart, He went beyond Himself and excited His Mother's Immaculate Heart to join its wondrous powers and untold worth to His, as if, though so far inferior to His, they were yet in some sense a necessary complement to His. And with this praise and worship we must join that silent and unutterable Te Deum, which every moment of that life was to the majesty of God. Who can imagine the thanksgiving of His Soul for the joys and prerogatives of the Hypostatic Union, and all the marvels and blessings that come along with it, and the way in which that thanksgiving comprehended all the blessings of the Creator to His creatures, past, present, and to come? If all the countless spirits of Angels, with the various beauties and eminences of their different choirs, could cast their whole beings into some heavenly fire and bum away like incense in the presence of the Most High, the offering would be nothing-worth, the thanksgiving not worthy to be mentioned, in comparison with the slightest elevation of the Sacred Heart in Mary's Womb. Furthermore, in this life He united the apparently incompatible states of Viator and Comprehensor. He was at once on His way to bliss, with merits to augment and acquire, with a work to do, a sacrifice to make, sufferings to endure, and a perseverance to accomplish; and also He had arrived already at the term, He had comprehended the full reward, and there was nothing either of kind or of degree which could be added to the Vision of God which He enjoyed already. Indeed His being Viator at all was a sort of violence to the Son of God, a voluntary violence which was itself part of the lovingness of the mystery of the Incarnation. Indeed it was love which united the two incompatible states. From the first moment of that mysterious life He offered Himself to the Eternal Father, with all His graces; He offered Himself without reserve, and for everything, and with the most consummate purity of oblation. He was filled with compassion for all the miseries of creation, and this never left Him henceforward; and most of all did He feel for sin, the greatest and the truest of our miseries, and He distinctly and separately pitied the sins of each one of us in particular. Nay, He at once took the burden of them on Himself. He assumed it with love, took the cross from His Father's hands and ours, and embraced not only all the sufferings needful for our redemption, but also all that prodigality of unnecessary suffering which characterized His ever blessed Passion. For the glory of God and for our salvation He begins His work in that secrecy with fervour, and He continues it with constancy. His freedom was perfect, and hence in the first instant His merits were infinite; for the worth of each action was infinitely meritorious. He surrendered Himself as a prisoner in His Mother's womb, for crime, for debt, and as a prisoner of war, as if He were a delinquent threefold by all those three liabilities. He only left His prison to suffer and to expiate, and it seems as though He loved it so, that He repeats His state of imprisonment in the Blessed Sacrament. Neither was it less a state of dependence than of imprisonment; for He made Himself dependent on Mary for life, for nourishment, and for preservation. It was also a life of solitude; for He was in so sweet a desert, so absent from creatures, so alone with God in the most perfect of sanctuaries, that the calm, unworldly cloister of the contemplative cannot compare therewith; neither did He hasten to leave it, for He is not idle there. And there also, and to Him, silence was, as usual, the sister of solitude. He was conceived in the silent night; and though He was the Word, yet He spoke not, but was silent then and afterwards, as He is in the Blessed Sacrament, thus consecrating the practice of silence for His servants, and His Saints. His occupations there were sufferings, humiliations, weaknesses, poverty, prayer, obedience, and desire, as they are His occupations now and always beneath the species in the Blessed Sacrament. He suffered from the inconvenience of His prison, and the self-abnegation of such a state, when He already possessed the full use of reason and that transcendently perfect and superhuman consciousness which the union of His Soul with the Person of the Word alone could give: and to which mere human consciousness is in nowise to be compared. He suffered also from the anticipation of future suffering, and as it were inflicted upon Himself with intensest keenness all the sufferings of His Mother, His martyrs, and His elect. His humiliations were inexplicable; for as well might we hope to tell the Eternal Generation of the Word as to express the depth of His humiliations. His Conception, a mystery all radiant with the beauty of the most heavenly chastity, the sole contemplation of which is the delight of pure souls, was to Him an infinite abasement. That He did not "abhor the Virgin's Womb" was a condescension simply and literally infinite. He humbled Himself also before God for the littleness and nothingness of His created Humanity, and before men for the future indignities He had chosen hereafter to endure. If His Soul abounded in the joy of the Beatific Vision, and His reason in the might of its glorious and unequalled perfection, the weaknesses of His Body were only the more remarkable, such as His inability to speak, to change His posture, and to use His senses, just as He is, and as He vouchsafes to be, in the Blessed Sacrament. The marvellous poverty of the Blessed Sacrament is foreshadowed also in the poverty of this secret life. He lies there despoiled of His glory, in some sense despoiled of Himself, and condescending to need us His creatures; and His prayers there were continual, for all of us; nay, can I doubt that there and then, with plainest foresight and sweetest forebearance, He actually prayed for me, and that I am feeling at this moment the unweakened force of that distant prayer? The obedience in the womb to His Mother, to the appointed time, and to the future behests of all men, even sinners, enemies and executioners, presents an exact parallel to His obedience in the Blessed Sacrament; and while He inspires Mary with holy desires to give Him to men, to see Him with her eyes, and to serve Him as her Son and her God, He Himself lives a life of intensest desires to glorify the Father, to save the souls of men; nay, perhaps He even longed to quit His sweet sanctuary in order that He might enter on a life of yet deeper and keener suffering. It would simply weary the reader to repeat almost word for word this description of our dearest Lord's Life in the Womb, changing the phrases to apply it to the Blessed Sacrament. The parallel is so complete, that it must already have suggested itself; and I have dwelt upon it at greater length, because, as the devotion to the life in the womb is especially a devotion of interior souls, so the corresponding thoughts with regard to the Blessed Sacrament are those which are most familiar to interior souls in their prayers before the tabernacle; and again as all the mysteries of the Sacred Infancy take their colour and character from the life in the womb, to establish the analogy between it and the Blessed Sacrament is in truth to establish the analogy between the Blessed Sacrament and the Sacred Infancy altogether. But the comparison is as yet by no means exhausted. If we pass in review the other mysteries of the Sacred Infancy, we shall perceive the same resemblance; and the more we descend into minute details the more striking the similitude becomes. 10. All for Jesus, chap. vii, sect. 2.